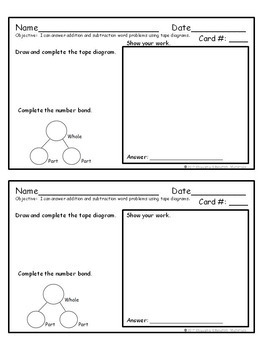 Tape Diagrams are used to help students visualize the whole, part, and part to determine which operation is needed to solve each word problem. A student recording sheet is included with this download. 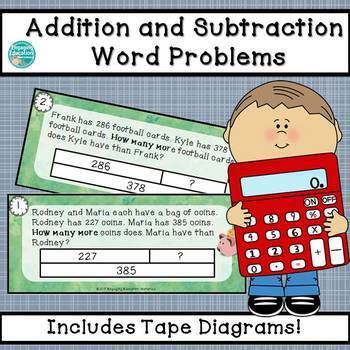 On the recording sheet, students are able to draw the tape diagram, complete the number bond for the corresponding equation, and show their arithmetic for each word problem. 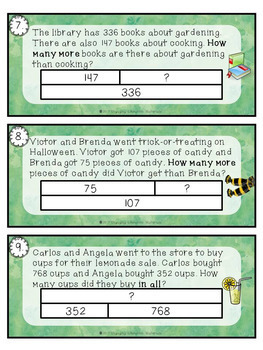 These word problem cards can be printed in color, cut apart, and laminated. These cards work well as a math center activity. There are 12 word problem cards total. 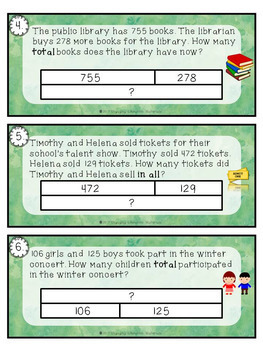 An answer key is also is provided. Looking For More Products Involving Tape Diagrams? Check These Out! Money Word Problems Using a Tape Diagram. Measuring in Centimeters Word Problems using Tape Diagrams.